Rid yourself of stress in a log cabin at Sterling Ridge Log Cabin Resort. Instead of your stress “hiking” up, take a hike and notice the crunch of new-fallen snow beneath your boots as you step from your private log cabin. Take a deep, deliberate breath of the fresh, crisp mountain air in rural Vermont. Pause a moment to stop and listen-really listen-to the sound of birds chirping (and putting aside the twitter tweeting), small critters skittering in the woods, the gentle lapping of waves in our pristine 14-acre pond. While wandering around, having a stress free walk, take a moment to stop and really see the beauty of nature that surrounds you in our quiet corner of Vermont. There is no better way to reduce stress during the holidays than to take a walk in the woods, and no better place to do it than wandering Sterling Ridge Log Cabin Resort’s beautiful, meandering hiking trails. We welcome you to find peace here at the holidays. Would you prefer to stay inside your log cabin? 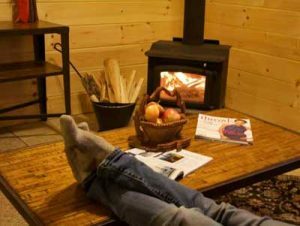 Sit in your own log cabin by your roaring fireplace or wood-stove, snuggling under a soft blanket while enjoying a good book knowing that the beauty of Vermont is right outside the door of your log cabin. This is the way to stay stress-free in Vermont and escape the hustle and bustle of the holidays.